EXPO-2005, the world's largest exhibition of scientific and technological achievements, will open on March 25 in Nagoya, Japan. The Russian exhibits - 17 tons delivered in 13 containers - obviously show that high-tech output ultimately determines a country's economic might. And the main Russian exhibit in Japan - a life-size model of the Kliper transport shuttle - is a significant event in world space exploration. "The initial plans were to display the Kliper at the Le Bourget aerospace show [in June]," said Vladimir Strashko, the commissioner general of the Russian exposition at EXPO, "but we decided to unveil a full-size model of the spaceship at EXPO-2005 first." Moscow is eager to show its new achievement as soon as possible, because it means that Russia will soon become the second country with a space shuttle, which will be a new-generation one at that. I'm not going to reiterate here my sentiments regarding NASA and the Shuttle. But I will say that, unlike us, the rest of the world is learning from our mistakes as well as their own. Yes, the end of American supremecy in space (at least as a nationalized industry) is at hand. We need to face up to it, accept its reality, and look at future progress in space as acheivements of humankind in general. Why else would the average jomo in some third-world country have given a damn about the American acheivement of landing people on the moon if it wasn't looked upon as an acheivement for humanity and not a specific country? Certainly that is what we expected from the rest of the world, and rightly so. So we should be willing to abide by the same spirit when it is no longer us leading the way. Yes we shot ourselves in the feet by our short-sighted policies. If we decide to be nice and diplomatic with the rest of the world for a change we might still be allowed to play in this as a partner with Russia. Or we could blow everything (literally) by alienating what's left of our goodwill by launching a war with Iran later this year. It will likely happen. I suppose the question to be posed is: Will a war with Iran benefit NASA (after all, it was a creation of the cold war)? It's almost remiscent of the 1950's when it was the Soviet satellite Sputnik going over American heads, while all we could do at the time is watch. The Dark ages I tell you. If Kliper is designed like Buran then I wouldn't worry too much. When I first heard about Buran years ago, and how it was supposedly a copy of the US shuttle, I thought "hoo boy, they're going to make the same mistakes we have". And then I had not heard a thing about it in recent years. The really sensible thing they're doing (according to the Buran article) is not relying on the thing as their primary vehicle into space. Energia itself is not exactly a cheap vehicle to use --- almost like a Saturn rocket -- not for casual use. But since the Russians have promoted Energia as a commercial vehcle (at least since Challenger), it hasn't been a drain on agency funds either. If Kliper can "go to the moon" as the first article suggests then it is something different than Buran. Exactly how remains to be seen. But it sounds exciting. The European Space Agency (ESA) on Friday pledged its backing for Russia's plans for manned spacecraft called Kliper, the news agency Itar-Tass reported here. Daniel Sacotte, ESA's director of human spaceflight, microgravity and exploration programmes, said here his organisation "would support" the project, it said. The project was discussed by Anatoly Perminov, head of the Russian Space Agency (RSA) and visiting ESA chief Jean-Jaques Dordain, it said. Dordan said a Russian-ESA collaboration plan would be put to a meeting of ESA ministers this December, and added hoped that other countries would join the Kliper scheme, with the goal of enabling its first flight around 2011. Kliper (Clipper), the brainchild of Russian space corporation RKK Energia, is sketched as a successor to the venerable Cold War workhorse of space, the Soyuz capsule. It would be a reusable, wingless space plane that would glide back to Earth, with up to seven people on board. It would be used for ferry services to the International Space Station (ISS) or for space tourism. Mockups of Kliper have been shown in aerospace shows in Europe and Japan in the hope of whipping up interest in it. As long as they don't toss the Soyuz to the side in favor of the Clipper, but instead use them both concurrently. If they are smart and not repeat the mistakes of the US space program, then soon...the Russians will have an armada of space crafts. The red menace scare of the early days of the space program may have come back to haunt us. Visitors to the Paris Air Show are being treated to a full-scale mockup of Russia’s proposed Kliper spaceliner. The multi-use vehicle is one piece of Russia’s Rosaviakosmos display at the Pairs Air Show now underway until June 19. Rosaviakosmos is Russia’s Federal Space Agency, with the Kliper design a product of that country’s Energia Rocket and Space Corporation. The exhibit includes a look inside the Kliper (or Clipper in English), showing the placement of passengers behind a flight crew. Russia is touting the spacecraft as a replacement for their workhorse spacecraft, the Soyuz. Much like NASA’s Crew Exploration Vehicle (CEV), future destinations for the Kliper are said to be the International Space Station, the Moon, as well as Mars, according to Russian officials. It could also serve as an emergency rescue craft for space station crews. At the Paris Air Show, Anatoly Perminov, head of Russia’s Rosaviakosmos, has made note that both Europe and Japan have expressed interest in joining in on Kliper development. However, decisions were still to be made as to how they could contribute to project, according to RIA Novosti, a Russian news agency. Russian space officials forecast that the Kliper can carry six people: two pilots with the other four seats for astronauts or space tourists. In addition, the spaceship can haul up to 1,540 pounds (700 kilograms) of cargo. The Kliper could be in service in the 2010-2011 timeframe. Novosti has also quoted Perminov as saying that the Kliper can be launched from European as well as Russian spaceports. Kliper’s launch vehicle would be a Russian Onega rocket—a modified version of the Soyuz carrier rocket. I would like to see some amatuer pics of the craft. Russian officials said Wednesday their country's new Clipper spaceship will never become an alternative to the U.S. space shuttles. The Novosti news agency Wednesday quoted Anatoly Perminov, director of the Russian Space Agency, as saying: "Clipper will not be able to become an alternative to the shuttles neither by amount of astronauts transported by the ship, nor by loading capacity. That is why the assumption made by the media that with Clipper, Russia will be able to stop using Space Shuttles is not true." Russia will exhibit a full-scale model of Clipper during the MAKS international airspace show opening in Moscow next week, Perminov added. Officials said Clipper is to replace the disposable Soyuz spacecraft that is currently used to supply the International Space Station. The main difference of the Clipper from the U.S. space shuttle project and the Russian shuttle Buran is that it is made of two parts and only the piloted compartment is capable of multiple uses. The hardware compartment is disposable, just as are current Russian spaceships. One Clipper spacecraft will be capable of 25 space missions, MosNews reported. The first unmanned flight of Russia's Clipper space shuttle has reportedly been set for 2011, with the first manned flight scheduled for 2012. Nikolai Bryukhanov, deputy director general of the Energia Rocket and Space Corp., told Delovoy Vtornik (Business Tuesday) the Clipper will replace the Soyuz and the Buran spacecraft, becoming Russia's main spaceship for the coming decades. The Clipper is a shuttle craft with improved aerodynamics, allowing it to cut regular G-forces by 2 to 2 1/2 times, and irregular G-forces by 5 times, the Russian news agency Novosti reported. It will also be able to maneuver during the controlled re-entry stage, increasing the precision of the landing. The Clipper will be able to deliver a six-man crew to the International Space Station, Bryukhanov said. With a Clipper docked at the station, the permanent ISS crew can be increased by two to three times. Although Russia can build the Clipper using domestic technologies, the Federal Space Agency believes it will be more effective and strategically important for Russia to involve other nations in the project, Bryukhanov said. The Energiya Rocket Space Corporation suggests using the new Kliper spaceship to create an assembly shop for a lunar complex in orbit, Nikolai Sevastyanov, the chief of the Energiya Rocket Space Corporation, said on Thursday at the meeting to welcome the return from space of the eleventh main expedition to the ISS and of the third space tourist, reports Itar-Tass. Sevastyanov said the use of the new means of space transportation would make space flights more accessible. "We create the new spaceship Kliper whose use will make it possible to broaden the market for space flights, so that not only professional cosmonauts but also researchers and commercial space tourists will be able to make such flights," he said. Sevastyanov believes the ISS now can have wider uses. "The ISS is a space port where research is conducted and new technologies for the ground are tested. The two novel tasks are to create industrial pads in orbit to try out technologies for a complex for flights to the Moon, as well as interplanetary technologies," he said. The new tasks require permanent presence of a large number of people in space, which should be ensured by hips of the Kliper type. BERLIN — European governments tentatively have declined to take a role in Russia’s Clipper manned space vehicle project, saying Europe would not have control over the program and would be limited to being a small industrial contributor, according to European government officials. European Space Agency (ESA) government ministers discussed a contribution to Clipper and a half-dozen other proposed space investments Dec. 5 during the first of two scheduled days of meetings here. No decisions will be made until the 17 governments finish their deliberations Dec. 6. But the Clipper program won very little support during the first day’s discussions, according to French Research Minister Francois Goulard. ESA spokesman Franco Bonacina said after the session that the Clipper proposal — a two-year research effort valued at about 51 million euros ($59.8 million) — had not found much backing. Russia has proposed that ESA and Japan join Clipper as an alternative to NASA’s Crew Exploration Vehicle. Japanese officials have said they are evaluating the idea and that they would be more likely to join the Russian program if Europe did. Government officials said debate continued on how much Europe should spend on its science program in the coming years, and on its role in the U.S.-led international space station. The Clipper, designed after the US Shuttle, is a poor design and I'm not surprised at the backouts. Russia's Federal Space Agency will hold a closed tender among Russian space industry companies for the construction of a new "Clipper" manned spacecraft, the head of the agency said Wednesday, reports RIA Novosti. Anatoly Perminov said, "We are now preparing to hold a closed tender among Russian companies." Other than Energia rocket and space corporation, he did not specify which companies would take part in the tender. As NASA prepares to once again send humans to the surface of the Moon, Russia is also developing its own plans for future manned spaceflight. The country's Clipper project to develop a six-person spacecraft to deliver astronauts into Earth orbit, and potentially beyond, appears in some ways to be the Russian Federal Space Agency's answer to NASA's Crew Exploration Vehicle (CEV). "We're starting to design this new transportation system to support the International Space Station (ISS) once it's complete," said Nikolay Sevastiyanov, president of the Russian aerospace contractor RSC-Energia, during a recent space conference where the program was discussed. The winged crew vehicle, Clipper, would launch atop a Russian Soyuz 2-3 booster and could form the heart of potential Moon- or Mars-bound craft, according to RSC-Energia designs. Separate cargo pods could also launch atop a separate Soyuz rocket. 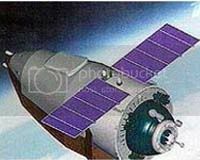 Both the Clipper vehicle and cargo pods would be towed to the ISS. Outside participation in the project by the European Space Agency (ESA) appears on hold after ESA ministers decided this week not to fund a two-year, $59.8-million (51-million euro) trial to study Clipper with the Federal Space. Last month, however, Federal Space Agency officials said they expected the Russian government to invest up to $795 million (23 billion rubles) in the Federal Space Agency in 2006, from which the Clipper program and others will draw their funds. Japanese space officials are also discussing whether to join the Clipper effort, according to ESA officials. While the ESA has no current plans to join Russia's Clipper program, agency officials have said such an alternative access to the ISS would be a valuable tool. NASA space shuttles and Russian Soyuz vehicles are currently the only spacecraft capable of launching humans to the station. Having two different types of space crafts is quite cool...let's see how it works out. A new reusable space craft designed in Russia will start delivering crews and supplies to the world's sole civilian orbital station in 2015, the head of Russia's leading space corporation said Wednesday, reports RIA Novosti. The General Director and chief designer of Energia, Nikolai Sevastyanov said the Kliper would replace the Soyuz spaceship, the veteran workhorse of the Russian and Soviet space programs, for taking crews and supplies to the International Space Station (ISS). The new shuttle has a number of advantages. For example, it will be equipped with an orbital transfer vehicle and a container with a capacity of 12 metric tons, compared with the Soyuz's two-ton capacity. This will cut transportation costs considerably, Sevastyanov said. Russia has borne the main burden of bringing crews and cargoes to the ISS in recent years, as the United States was forced to ground its shuttle fleet for two and half years after Columbia crashed in February 2003, killing all seven astronauts on board. Flights only resumed in July last year, when Discovery completed a mission successfully. It does not sound likely that Russia will employ a reusable spacecraft in 2012 - but it is. On Friday, February 3, the Russian Space Agency is due to announce the developer of a new Russian reusable spacecraft, reports RIA Novosti. "We are currently working on a new spacecraft. It is going to be reusable, a hybrid of capsule Soyuz-class and winged Buran-class vehicles. The new design should ensure safer and more reliable space flights," the executive said. The idea is that the new spacecraft acts most of the time as a conventional Soyuz-class capsule, with wings folded, and protected, by a heat-resistant sabot. As the descent vehicle heads back to Earth, the sabot is discarded, the wings are unfolded, and the vehicle lands like an aircraft. The convergence between the Soyuz and the Buran is going to give the new vehicle compactness and interoperability, with rescue systems along with advanced flight characteristics. A lighter version is going to weigh no more than seven tons, which will make the new spacecraft compatible with Soyuz launch vehicles. Meanwhile, its heat resistance capability, unlike conventional winged space vehicles, will be based on an alloy coating, rather than tiling. "The spacecraft is going to be orbited like a capsule, while the landing procedure will be the same as for a fixed-wing aircraft. This enables re-entry at an earth escape velocity and safe landing after an interplanetary mission," he added. Well now this changes things. Not like the typical Shuttle design, but riding atop the booster stages with emergency escape provisions. It seems that the Russians are learning from our mistakes.